When it comes to maintaining firearms, Swab-its’ Bore-tips offer improved barrel cleaning and lubrication while the Gun-tips line offers four distinct sizes and lengths of swabs to ensure cleaning and lubrication of the harder to reach areas that are often neglected. 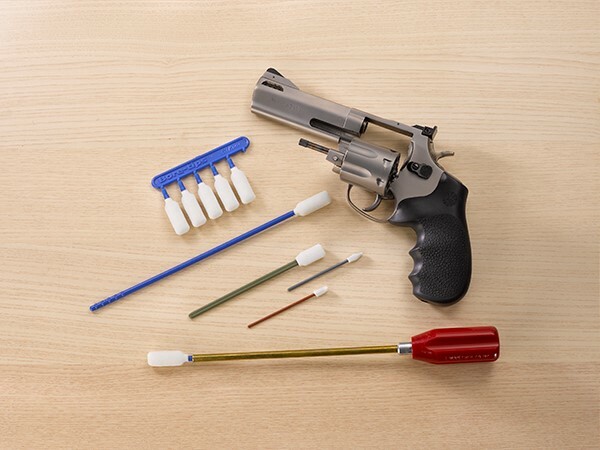 Reusable and easy to clean with soap and water or mineral spirits, Swab-its products are more thorough, quicker and easier to use than traditional methods of firearms cleaning and do not leave the residue or lint left behind by patches, mops and cotton swabs. Unlock the cylinder and ensure that your firearm is unloaded by visually and physically inspecting. No ammunition should be present while cleaning. It is advisable to have your manufacturer’s owner’s manual handy for reference for proper disassembly and maintenance procedures. 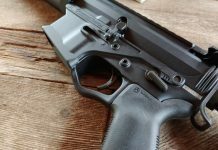 If you purchased your gun used, many manuals can be downloaded by accessing the manufacturer’s website. 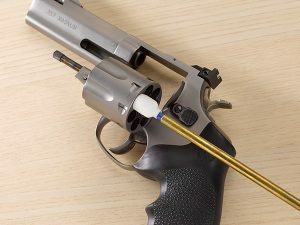 You may find it easier to clean your revolver by removing the cylinder from the frame. This is easily accomplished with a single action revolver. For double action revolvers, just swing the cylinder out of the frame for ease of access. This will allow you to access around the forcing cone as well as more comfortable addressing the chambers. 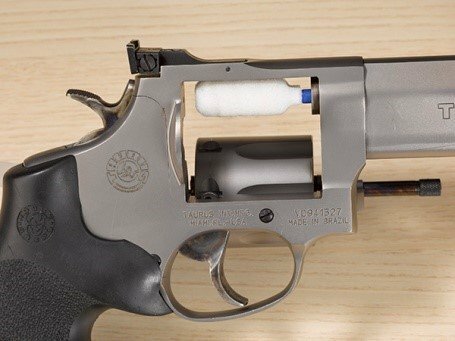 In this article, we will address cleaning the Revolver. 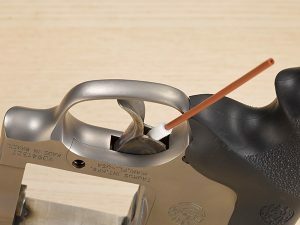 To demonstrate, we will clean and lubricate a Taurus Tracker .357 Magnum in titanium. 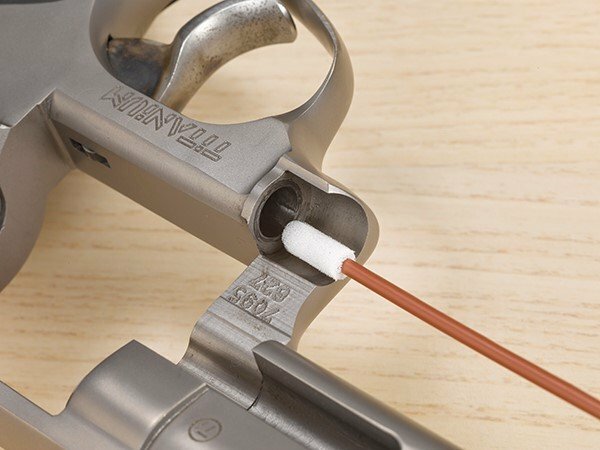 With their chisel point, Gun-tips 3” precision swabs are especially useful in digging into the hand, stop and the compensator. Because fouling can build up in the cylinder and interfere with chambering and extraction, cleaning the cylinder is essential. Generally, all that’s necessary is to wipe the cylinder face with solvent. The 5” large surface swab is ideal. If there’s built up fouling, use of a toothbrush and solvent will generally do the trick. It isn’t necessary to remove all traces of carbon stains. 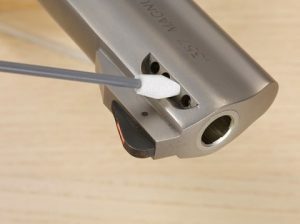 Just remove any buildup that might cause binding between the cylinder face and the rear of the barrel. 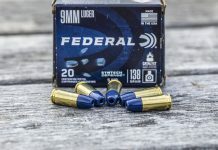 Especially for those who’ve fired lead bullets, there may be a dark gray buildup on the outer front edge of the cylinder and in the cylinder flutes. Again, a brush and solvent can address this if the swab is not aggressive enough. A swab with solvent or a toothbrush should be used to scrub the rear of the cylinder and the ejector. Lift the ejector up and clean underneath. Trapped fouling can cause the cylinder to bind and grit under the ejector can become embedded in the metal when fired, so this area should be scrubbed as well. The rounded tip of the 3” mini easily accesses the yoke and gets behind the trigger. Due the absorbency of the foam, less solvent is required than you may generally be accustomed to using. An application of solvent should be made and allowed to soak before applying a bore brush. 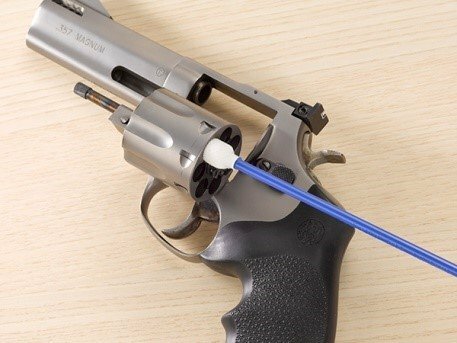 Hint: Protecting the revolver from damage when the bore brush is being pushed through the barrel can be accomplished by tying an old sock or some other rag around the rear cylinder opening, creating a soft “stop” before hitting the breachface. Following loosening fouling with the bore brush, reattach the Bore-tip used in solvent application. Run through the barrel, blotting off on a rag or paper towel to remove fouling. Repeat as needed until no new fouling is loosened. Use a clean Bore-tip for drying and, if storing your gun, another clean swab for applying lubrication. 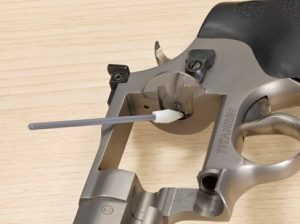 Swab-its offers two choices when cleaning the barrel of .357/9mm handguns. Bore-tips come on a runner of six swabs which snap off and can be screwed into a standard 8/32 cleaning rod. For the ultimate in convenience, Bore-sticks are a 3-in-1 unit that replaces the patch, jag and rod. Available in packages of four, Bore-Sticks are ready to go straight out of the bag; just apply your favorite solvent or lubricant. Remember: if you are storing your firearm and coat the barrel with light lubrication, this lubrication MUST be removed prior to shooting your gun. Swab-its products are washable and reusable. If you used a bio-based CLP, such as FrogLube, the swabs can best be cleaned by washing in a degreasing dish soap, rinsing thoroughly and allowing to dry completely before the next use. If you prefer a petroleum based solvent or CLP, cleaning the swabs can most easily be achieved by dipping in mineral spirits, blotting debris and air drying. 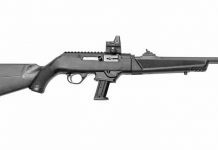 By Michele Makucevich, Firearms Products Territory Manager of Swab-its. She oversees the Rhode Island CMP and is a long-time youth coach and competitive shooter.